Terre is the practice manager at Crossroads Animal Clinic. She has been part of the Crossroads team since 1994 and has worked in the animal care field for more than 30 years. Terre enjoys helping clients by providing excellent care for their pets and working with the compassionate veterinary medical team at the hospital. In her spare time, Terre enjoys spending time with friends and family, bargain shopping and visiting new places. She shares her home with her husband and two sons, as well as Harley Bear (her aussie/shepherd mix) along with Dan the Man and Katy the Lady—both tripod kitties that rule the house. 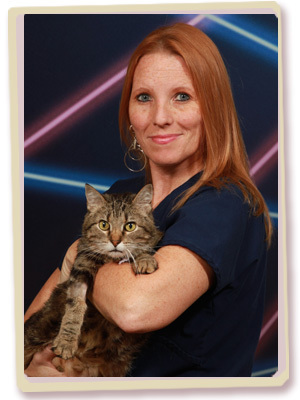 Client service representative Josie joined the Crossroads Animal Clinic staff in 2007. She has worked in the animal care field now 16 years and she believes Crossroads provides the best care possible for its patients. Outside of work, she likes playing adult softball and spending time with her boys. She shares her home with a Boxer mix named Rosie. 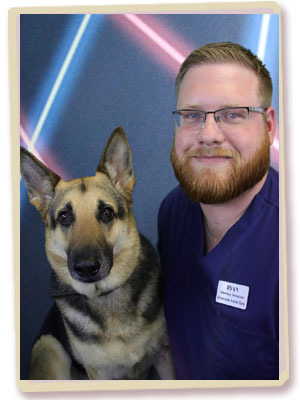 Motivated by his love for animals and desire to provide them with the best possible care, Ryan has been a part of the Crossroads Animal Clinic team since August 2013. As a veterinary technician, his duties include helping out during exams, assisting with surgeries, working in the laboratory, and helping with anything else asked of him. "I enjoy working at Crossroads because the staff is like family," he says. "Everyone is willing to do anything to help." At home, Ryan cares for a cat named Clementine, a German Shepherd named Maya, and a mix named Harley. He enjoys hunting, fishing, going to the racetrack, and geocaching with his dogs. Groomer Mary has worked at Crossroads Animal Clinic since January 2013, but she's been employed in animal-related positions for over 17 years. She has an Associate's Degree in Applied Science. At our hospital, Mary's job responsibilities include working with our clients to make their pets look their best, while helping to maintain their quality of health by monitoring for any issues that may be present. Since joining our team, she's become known around the hospital for her positive attitude and willingness to lend a helping hand. "I love working here because everyone is friendly and professional," Mary says. "The clinic is very welcoming, and the staff makes you feel like family." At home, Mary cares for two ferrets named Snickers and Twix, three cats named Zuki, Panyo and Gypsy, and a dog named Bella. In her free time she enjoys spending time with her kids, baking, watching movies, and attending sporting events. Client Service Representative Jennifer joined the team at Crossroads Animal Hospital in June 2016, where she strives to make operations run smoothly and efficiently. She's excellent at filling in gaps or missing pieces of the hospital's operations. Jennifer's daily responsibilities include greeting clients and their pets, keeping hospital records up to date on the computer, checking patients in and out, and helping clients with any questions they may have. She enjoys the fast pace of the hospital and that each patient is unique in their own way. "I love my job here," Jennifer says. "It took me awhile to feel like this was my family. I already was accepted, but when you have nothing it's hard to accept good things happening to you. This place and family have made me a better person and a better worker." At home, Jennifer has a 6-year-old Rottweiler named Buddy, an 11-year-old Shih Tzu named Monkey, a 2-year-old cocker spaniel named Henry and a 3-year-old Chihuahua named Cheeto. In her free time, Jennifer enjoys baking, sewing, watching movies, making her kids laugh and taking family trips. 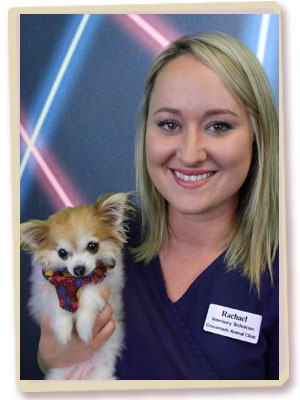 Rachael has been a Veterinary Technician at Crossroads Animal Hospital since August 2016. 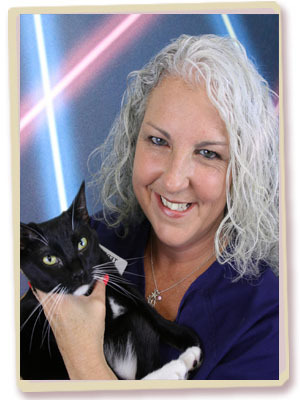 She's a positive person, and has over eight years of experience in the animal-care field. Rachael's responsibilities include drawing blood, maintaining quality control on bloodwork machines, vaccine reaction reimbursement, running rooms and checking out clients. 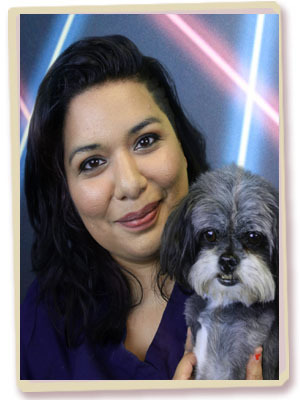 She holds an associate degree, and is a licensed veterinary technician in the state of Texas. "This clinic offers top-quality patient care while putting the needs of both the patient and the client first," Rachael says. "The honesty and integrity of both my coworkers and doctors on staff provide me with a wonderful work environment." At home, Rachael has an 11-year-old Chiweenie dog named Beans, a 6-year-old Chihuahua named Willow and a 2-year-old Brittany named Rowan. Outside of the hospital, she enjoys spending time with her boyfriend and her three dogs. 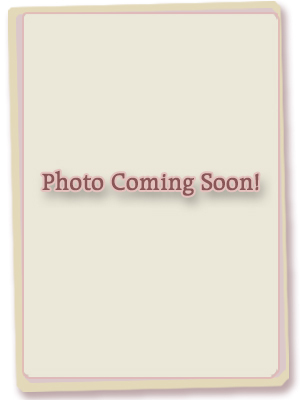 Rachael also enjoys gardening at her house and taking walks with her fur family. 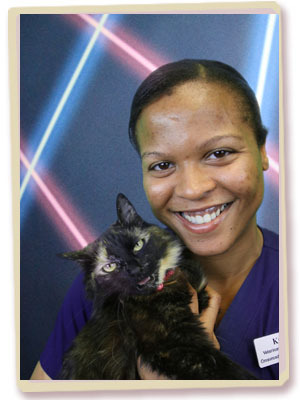 Veterinary Technician Kris has been working for Crossroads Animal Clinic since March of 2017. Before her involvement with our group, Kris worked as an Animal Control Officer, then moving on to work as a Day Care Assistant and Kennel Assistant. Here at Crossroads Animal Clinic, Kris works alongside our talented veterinarians, helping to greet our clients and their beloved pets, determine the reason for their visit, and assisting our doctors with their assessments and plan of action. In her free time, Kris enjoys perusing yard sales and thrift stores to find the best treasures for the best prices. Kris also enjoys the active life, including attending and watching baseball games, football games, and basketball games. She also likes to go hiking and going to the gym. When Kris feels like kicking back to relax, she likes spending her downtime with her family and friends. Pilar is a veterinary assistant that received their Veterinary Assisting Certificate in 2017. Pilar helps with assisting technicians and doctors with anything that they need in the facility. 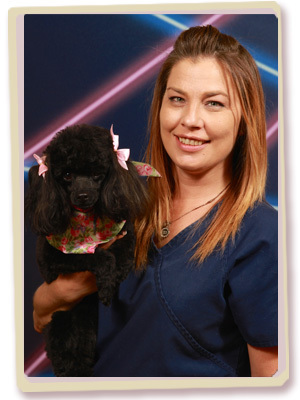 She loves to come into the office and learn something new every day, and enjoys bonding with pets and clients! When not in the office, Pilar is taking care of her two pet cats – Gypsy and Simba, spending time with family, going to shows and traveling! Communicating effectively with owners and interacting with patients to get the most information is an everyday occurrence with Veterinary Technician, Chris Antony (Yes, my mom forgot the H). Chris was welcomed to the Crossroad Animal Clinic team in July of 2018 and since has been working hard to help ensure our clients have the best experiences possible. He is always happy to learn, and does so with a smile. Chris is currently enrolled in TCC to finish his associate degree in science. Afterwards, Chris aspires to transfer to A&M University for their veterinary program. He is a great listener and is very analytical. 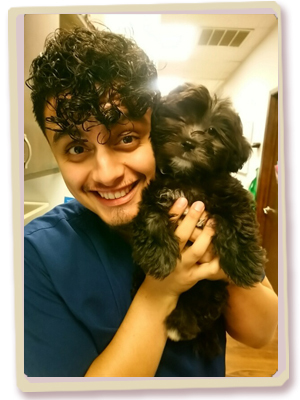 Chris has been working in the animal related field since 2014 working for different veterinary clinics. At home, Chris owns 3 Husky mixes. The oldest is named Charly, the next eldest is named Shadow, and Titan is the youngest of the group. Chris loves taking them for walks or going running. In his spare time, Chris enjoys working out and training in Muay Tai. He also served as a worship leader for about a year, and now is a youth pastor. Chris loves music and playing bass guitar or singing at his church. His goal on a daily basis is to show people hope and put a smile on people’s faces however he can. 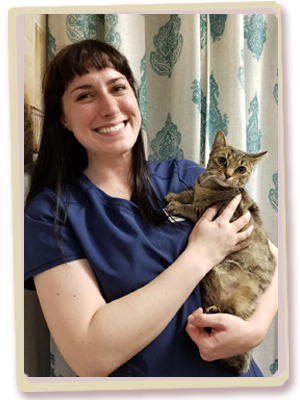 Caitlin was welcomed to the Crossroads Animal Clinic veterinary staff in June of 2018 and has been working part-time as one of our outstanding Veterinary Technicians. Some of Caitlin’s responsibilities here include providing client education and answering questions, monitoring in surgery, and providing general care to hospitalized or visiting patients. Microscopy is one area of her job that Caitlin likes best, as well as interacting with our phenomenal clients and their pets. One unique attribute Caitlin possesses is 2.5 years of avian wildlife rehab experience. She has also administered rehabilitation and husbandry services at a reptile and exotic pet store before coming to our facility. 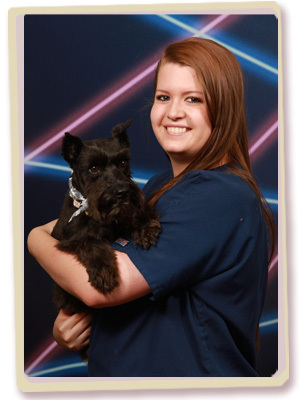 Caitlin has an associate degree in Veterinary Technology and is in school for graphic communication. Away from the animal clinic, Caitlin has a few pets of her own. She owns a chested gecko named Flapjack, a leopard gecko named Dot, a green-cheeked conure named Chili Bird, and a tri-color tabby cat named Snickers. In her down-time Caitlin likes practicing photography, going for hikes, or staying in and playing video games. Noelle joined the team at Crossroads Animal Clinic in January of 2015. Since coming on board as a kennel assistant, her duties have included keeping the kennel area clean, stocking around the clinic and providing other assistance whenever and wherever it's needed. Noelle is enrolled at Tarrant County College, pursuing her doctorate. "I like working here because it's fun and very rewarding," Noelle says. "The doctors and other staff members are awesome, and I feel welcomed and liked here." At home, Noelle enjoys fishing, hunting, playing video games, and four-wheeling. She's also the proud pet parent to three domestic shorthaired cats named Malibu, Jager and Fireball, a Miniature Schnauzer named Schatzi, a Polish Rabbit named Aggie, and two Quarter Horses named Doc and Gus.